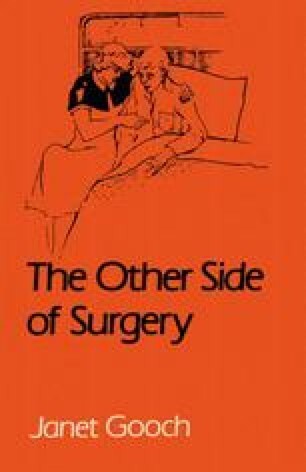 While the people who are admitted for specialist surgery may have the same fears and needs as every other patient, each speciality does, of itself, cause certain particular difficulties. To ignore these extra problems is to suggest that the woman in the gynaecology ward needs exactly the same treatment as the man in the general surgical ward or the teenager in the burns unit. There are indeed some concerns and questions that they all have in common but it is the special needs of each that demands the difference of understanding and approach. The expertise of the nurse working within the specialist areas of surgery lies not only in her knowledge of, and ability to perform, the different practical and technical procedures required. More particularly it is the quality of her special understanding of the people in her care that makes her the best possible person to nurse patients in that area.